Philip Morris (PM) and RJ Reynolds (RJRT) have instituted a voluntary program for reporting tobacco product sales, or Scan Data. StoreTender supports reporting to either of these programs through the Scan Data addon module. 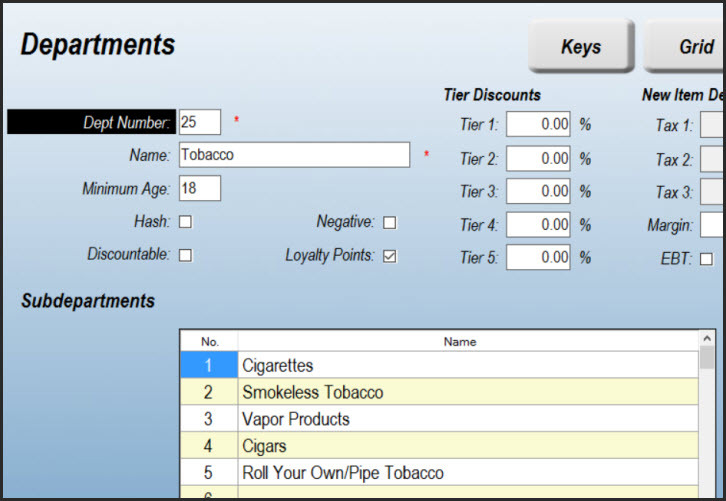 The addon will track your tobacco product sales and generate on-demand weekly reports that you can then submit electronically. All tobacco products that are properly entered (as defined below) will be reported on. To start, view the Addon Modules page of our website. Once your order is placed the addon will be activated shortly thereafter. Meanwhile, you will most likely need to make some changes to how your product data is categorized. Because these reporting programs have strict rules about data structure, you must categorize your tobacco products into Brands and Departments with specific names. You will end up with a Department entry like the one below. If you already have a Tobacco Department, you can use that (the department number is not relevant). It is important that all of your tobacco products reference the Tobacco Department as well as one of the above 5 Subdepartments. This will be important as the Department structure is critical to the implementation of this program. Navigate to the Brands category (Data > Inventory > Brands). Create an entry for Philip Morris and RJ Reynolds - as well as for any other tobacco brands you sell. For Philip Morris, enter "PM" in the Parent Company field. For RJ Reynolds enter "RJRT" in the Parent Company field. For other brands you may disregard the Parent Company field. Note: If you are also participating in the USSTC Scan Data program, create a Brand with the name "USSTC" and the Parent Company "PM". This will ensure that your USSTC products are included in the Philip Morris Scan Data report. It is critical that you enter the Parent Company initials exactly as specified. Only "PM" or "RJRT" (no quotes) will work! Note: If you are also participating in the Philip Morris Loyalty Fund Program (LFP), you'll need to create a separate Brand for LFP qualified products (Marlboro Mainline). Read this article for more details. On the Products screen (Data > Inventory > Products) for each tobacco item, edit the record so that the proper Brand, Department and Subdepartment appear as outlined above. To make entry easier you may want to use the Grid function, found within StoreTender Pro or Back Office. Additionally, you are required to report the size ("consumer units") and UOM (unit of measure) for each item. Using the Size and UOM fields on the Product record, enter the appropriate data. The only acceptable abbreviations for the UOM field are: PK (pack), CT (carton), EA (each), CN (can) or RL (roll). 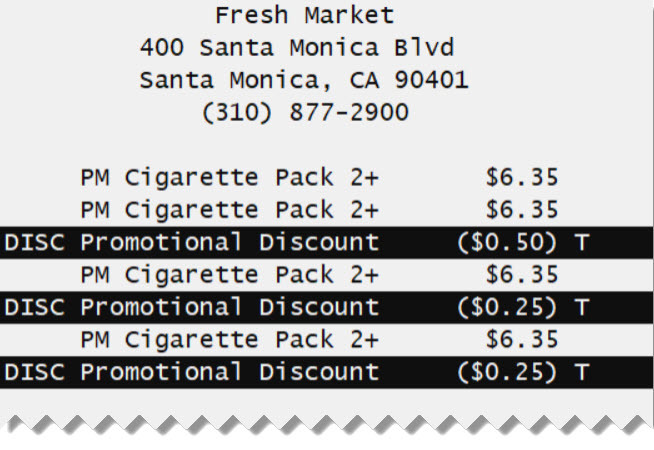 You can create Price Formulas that can be applied as a multi-pack discounts or promotions to your tobacco products. Using this method eliminates the need to manually enter the discount, as it will be automatically applied when scanning the products. For Philip Morris, you will use Price Formulas to create multi-pack discounts. For RJ Reynolds you can create multi-pack discounts (Outlet or Manufacturer) or single-pack promotions (Account, Manufacturer Buy-Down or Manufacturer Promotions). Only one Price Formula is allowed on a product at any time. Navigate to Tasks > Pricing > Formulas and create a new formula. Use a discriptive name (or the provided promotion name from your account representative) and select Option 7. In the Qty + field, enter the threshold quantity that qualifies for a discount. For example, if the discount is "$1.00 off 2 packs", enter "2". Enter the amount of the discount to be given once the threshold is met, in the Discount field. In the above example you would enter $1.00. 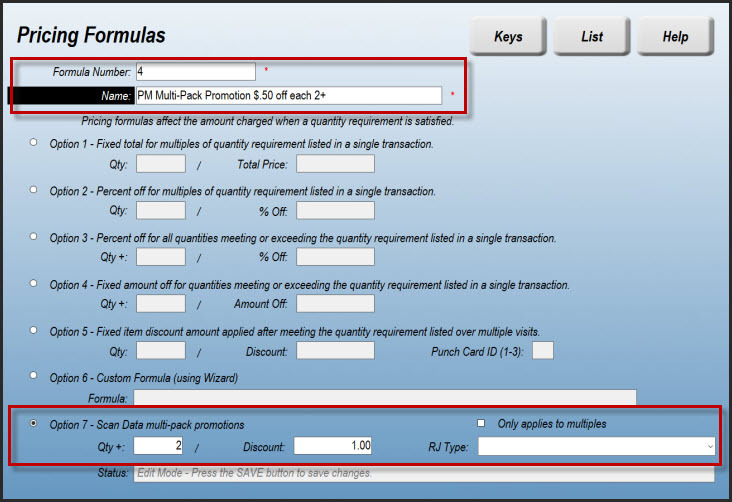 Check the "Only applies to multiples" box if the promotion only qualifies for each multiple of the Qty+ field. For example, if the promotion gives a $0.50 discount for each pack when 2 packs or more are purchased, leave this box unchecked. In the case where multiples are NOT checked, you want to enter the value of the threshold (i.e. 2 or more) pack discount in the Discount field. You can use either of the two above promotions for Philip Morris multi-pack or RJ Reynolds multi-pack (Outlet) promotions. For the following RJ Reynolds promotions, you must select the "RJ Type" from the dropdown list. For the "Outlet Multi-Pack" promotion, keep the RJ Type field blank. If you participate in the RJ Reynolds scan data program and are creating a Philip Morris (Altria) Multi-Pack promotion, you may have special considerations to take into account. While Philip Morris (Altria) does not differentiate between account (Outlet) funded and manufacturer funded multi-pack discounts, RJ Reynolds does. Therefore, if the Philip Morris multi-pack discount is a manufacturer funded discount, you should assign "Mfr multi-pack" in the RJ Type drop-down box of the Price Formula. This will ensure that the discount is properly categorized for RJ Reynolds scan data reports. You can now LINK Price Formulas to be applied. 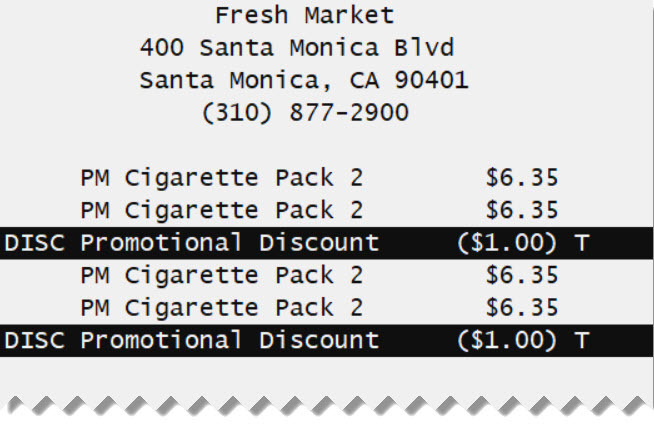 This allows you to have multiple Price Formulas on your tobacco products. For example, you may have an Outlet Multi-Pack promotion and a Buy-Down. The link selector is just to the right of the RJ Type dropdown. Just create your promotions and then on your primary promotion add the link to the secondary one. If you have 3 promotions, add the 3rd promotion link to your second Price Formula. You can have as many as you wish, daisy-chaining one to another. Just be sure that you don't create a circular link or the promotions will run wild on your POS screen. If you decide to use Link Formulas and one of the Formulas is a multi-pack discount, make that Formula the primary (first) one. This will ensure that the multi-pack discount gets written to both Philip Morris and/or RJ Reynolds scan data files. If you are going to support the Philip Morris Manufacturer Deal promotions, you must create touchscreen buttons that will apply a discount to your cigarette sales. As part of the Scan Data program, these promotions must be applied to the tobacco products using the proper function. For Philip Morris, you'll want to use Price Formulas for multi-pack discounts. If you want to use Manufacturer Deal promotions with Philip Morris, you'll need to follow the instructions below. These discounts are available through the Functions of the Screen Designer (Setup > Store > Other > Screens). Depending on which discounts you offer you may choose to use one or all of the available options. * Philip Morris allows for up to 3 separate Manufacturer Deal promotions. In the below image the promotional group has been created. 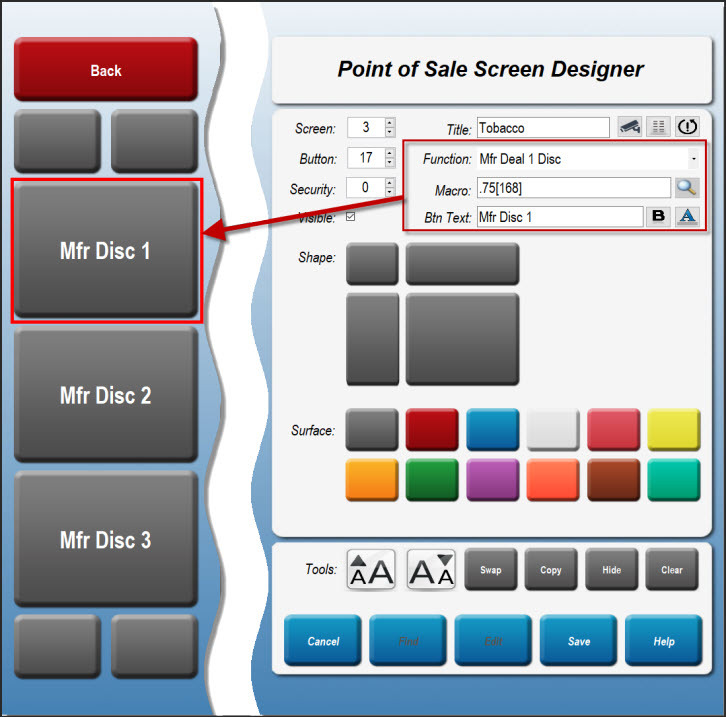 The top promotion - Mfr Disc 1 - has been created using the Function "Mfr Deal 1 Disc". As you can see from the above example, we've added ".75" before the macro function. This means that when this button is pressed, a $0.75 discount is ready to be applied. If you do not wish the discount amount to be calculated with the button press, simply leave the macro as it is. You will then need to enter the discount amount prior to pressing the promotion button on the screen. As you can see, by using the function screen you can create many promotions and save time by entering the value of the promotion directly into the macro field. Scan the tobacco product or select it from the search results box. If a Mfr Disc promotion applies, press the appropriate promotion function key. If you did not format the macro with a discount amount, enter that amount before pressing the promotion key. Now, touch the item to which the promotion is to be applied on the cashier receipt area. * Note: In the event that the Product has a Price Formula discount, and you want to add a customer to the transaction, the customer account must not be set to Tier Pricing discounts. If they are, then assigning the customer before ringing in the products will not allow the Price Formula discount to apply. You must add the customer at the end of the transaction, after the Price Formula discounts have been applied. Scan Data reports are to be submitted each week. For Philip Morris, the week ends on Saturday and the report must be submitted by the following Tuesday. For RJ Reynolds the week ends on Sunday and the report must be submitted by the following Wednesday. These reports are NOT intended for your use to track the amount of funds owed to you by the various manufacturers. They are used by the manufacturers to track sales and promotional data and are provided per their specifications. The reports are text-based, suitable for submission through the manufacturer's website or FTP. You will need to get in touch with your Philip Morris and/or RJ Reynolds representative before sending your first report. They will provide you with the information necessary for report submission. For single store merchants you can generate your report in StoreTender Pro/Back Office by navigating to Setup > Tools > File Utilities. 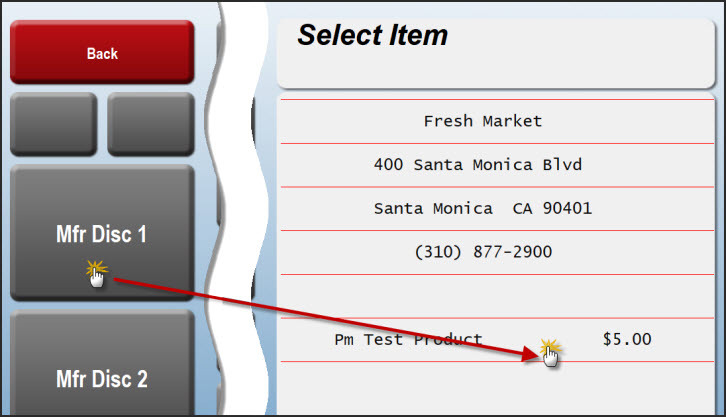 For multi-store merchants using StoreTender HQ, navigate to Tasks > Send Scan Data. The following steps will guide you through creating your report. Click the selection next to the report(s) that you wish to generate. Select the week ending date for your selected report. The calendar will only let you select the appropriate day of the week. If you select the incorrect day, the calender will automatically select the previous week's ending date. Click the folder icon to set the file destination on your desktop. Click Execute to generate the report and save the file. Navigate to the folder on your desktop where the report(s) were saved. They are ready for submission through the method determined by your manufacturer representative (typically FTP software like "FileZilla"). You will likely be required to submit test files before going "live". In the beginning of 2019, Philip Morris (Altria) test file submissions have been marked with the request that all discount fields are blank, if equal to '0.00'. Our software was coded to the current file specifications, which have no such requirement and specifically show '0.00' as acceptable. We've been informed by IRI (the Philip Morris Scan Data collection agency) that this new advisory is an undocumented request to change the content of the files. If your test file is rejected by IRI, simply inform them that the software is not capable of submitting blank discount fields. We have been told by IRI that this is acceptable and a waiver will be granted. If signing up for the RJ Reynolds Scan Data program you will be asked by the scan data collection agency to define the file format you will be submitting. The appropriate selection is "pipe delimited" and "without headers". Congratulations, you've set up and completed your Scan Data program configuration! StoreTender also supports the Philip Morris Loyalty Fund Program (PM LFP), used in conjunction with the PM Scan Data addon module. To learn how to configure your software read this article: Philip Morris Loyalty Program.